Discussion in 'Music Corner' started by mark winstanley, Oct 7, 2018. Elvis returned to the US March 2nd 1960 and was honourably discharged three days later with the rank of Sergeant. The train that carried him from New Jersey to Tennessee was mobbed the whole way and several stops were made to please the fans. Dave Hoos, MAYBEIMAMAZED, Mal and 4 others like this. 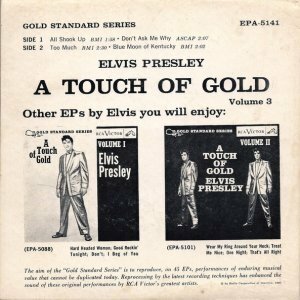 On February 16, 1960 RCA continued with re-releasing singles, that had previously been released, as part of their "Gold Standard Series". Rickchick and MaestroDavros like this. alexpop and MaestroDavros like this. "Stuck on You" is Elvis Presley's first hit single after his two-year stint in the US Army. He recorded the song during March 1960, and the single was released within weeks and went to number one on the Billboard Hot 100 chart in late-April 1960, becoming his first number-one single of the 1960s and thirteenth overall. "Stuck on You" peaked at number six on the R&B chart. The song knocked Percy Faith's "Theme from A Summer Place" from the top spot, ending its nine-week run at number one on the chart. The record reached number three in the UK. The song was written by Aaron Schroeder and J. Leslie McFarland and published by Gladys Music, Elvis Presley's publishing company. 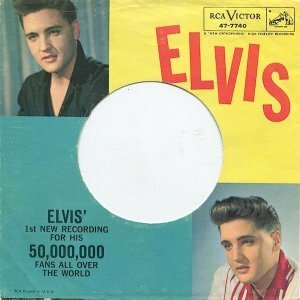 In New Zealand (and perhaps other countries), the single had a special paper sleeve with the usual RCA logo top left and 45 R.P.M. bottom left and included, in large letters, "ELVIS" top right and bottom left: "Elvis' 1st new recording for his 50,000,000 fans all over the world." So eighteen days after getting back into the country Elvis is in the studio recording, and two days after recording Stuck on You it is released. For me Stuck On You is a great track, it nods its head at the past and introduces a new smoothness to the Elvis sound. Well written, well sung, well mixed and tailor made for the hungry fans. Dave Hoos, MAYBEIMAMAZED, hugh . g. and 7 others like this. I'm going to leave it there today. Shaker Steve, RSteven and MaestroDavros like this. Stuck On You/Fame And Fortune was not only a blockbuster single, but really was a huge indication of Elvis's new found vocal range, especially in the lower register, that would enable him to take on such diverse and challenging songs in the future. Hank Garland's unique guitar playing on A Big Hunk Of Love as well as this single and others beginning in 1958 and lasting until his tragic car accident in 1961, cannot be overstated. This is the man that played the signature guitar and bass licks on so many of Elvis's great songs during this time frame, from Little Sister to (Marie's The Name) His Latest Flame. Hank Garland also played on Patsy Cline, Jim Reeves and Roy Orbison's hit songs as well. Garland would survive the car accident of course, but he tragically could not play the guitar in his truly virtuosi style that led Chet Atkins to proclaim Garland "The greatest guitarist in country music history." Garland was also quite adapt at jazz and just about any other musical style that you needed him to play on a record or song. JimmyCool, Mr. H, McLover and 6 others like this. This 45 was also released at the same time in stereo and launched RCA’s Living Stereo single series. Stuck On You sounds glorious in stereo. Thank you, Bill Porter. JimmyCool, Michael P, RSteven and 1 other person like this. Stuck On You is pretty fluffy, but I enjoy it anyway. The live version on the Sinatra show has the edge over the studio version for me. There's a bit more edge, while still retaining all of the playfulness. Speaking more generally, Elvis' early 1960s recordings are, imvho, the most enjoyable, most pleasurable music he ever made. There are more exciting recordings (Sun, early RCA, 1958 sessions), more emotional recordings (early 70s), etc., but when I'm in the mood to just sit back and let the music wash over me, there's nothing better than Elvis Is Back!, Something For Everybody, Pot Luck, GI Blues, etc. JimmyCool, Dave Hoos, vanhooserd and 7 others like this. I prefer Fame And Fortune over Stuck On You. bpmd1962, GillyT, RSteven and 1 other person like this. As there were so many repackaged and reissued items at the end of 59, i didn't want to do the double song, so as to give anyone with a care to, a chance to go through them, and catch up. I'm not a huge fan of the final master, but the earlier takes - in a different key - are some of the most moving Elvis performances I've heard. I remember how stunned I was when I first got a copy of the FTD of Golden Records 3...take 1 was (and I don't use this word lightly) a revelation. Rick H., D.B., MaestroDavros and 2 others like this. "Fame and Fortune" is a 1960 song by Elvis Presley. It was written by Fred Wise (lyrics) and Ben Weisman (music). 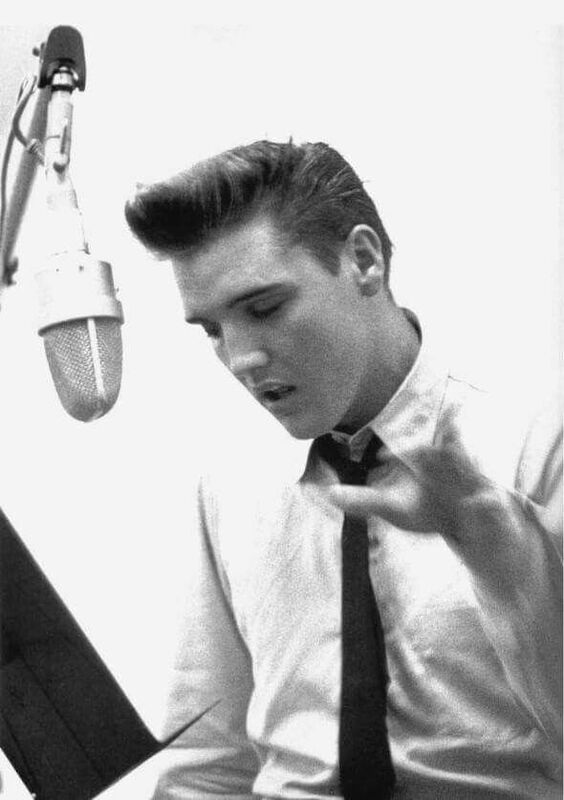 Presley recorded it on March 21, 1960 in the RCA Studio B in Nashville, Tennessee. The song was first released on a single as the flipside to "Stuck on You" (RCA 47 7740). It was Presley's first post-army single. "Fame and Fortune" peaked at number 17 on the Billboard Hot 100 on the week of May 5, 1960. while "Stuck on You" spend several weeks at number 1. In the United States the single "Stuck on You" (backed with "Fame and Fortune") was certified Gold by RIAA for selling in over 1 million copies. -------------------------------------------------------------- This is also a great song, lead by the piano musically, yet this song is lead by Elvis' vocal in reality. This is such a fine vocal that even if the song had been poor, it would still be a worthwhile track. Fortunately the song is excellent, and the vocal is magnificent. There is such a smooth beauty in this vocal it is almost disarming. Dave Hoos, hugh . g., Tord and 5 others like this. Following his third and last appearance on the Ed Sullivan Show, Presley received a notice from the Memphis draft board on January 8, 1957. The board announced his 1A classification and his possible draft before the end of the year. During the first half of 1957, Presley had three number one hits with "Too Much", "All Shook Up", and "(Let Me Be Your) Teddy Bear". His second film, Loving You, opened on July 30 to box office success. His Christmas album was released on October 15 and his third film, Jailhouse Rock, opened on October 17. On December 20, Presley received his draft notice. He was granted a deferment so he could finish the forthcoming film King Creole, which had already received an investment of $350,000 from Paramount Pictures and producer Hal Wallis. At the beginning of 1958, Presley's single "Don't" topped the charts. Presley was inducted into the Army on March 24, 1958. Soon after starting basic training at Fort Hood, Texas, he received a visit from Eddie Fadal, a businessman he had met on tour in January 1956. According to Fadal, Presley "firmly believed" his career was finished. After completing training, he joined the 3rd Armored Division in Friedberg, Germany, on October 1. Media reports echoed Presley's concerns about his career, but RCA Victor producer Steve Sholes and Freddy Bienstock of Hill and Range had carefully prepared for his two-year absence. Using unreleased material, they kept up a stream of regular, successful releases. Between his induction and discharge, Presley had ten top 40 hits, including "Wear My Ring Around Your Neck", the best-selling "Hard Headed Woman", and "One Night" in 1958, and "(Now and Then There's) A Fool Such as I" and the number one hit "A Big Hunk o' Love" in 1959. 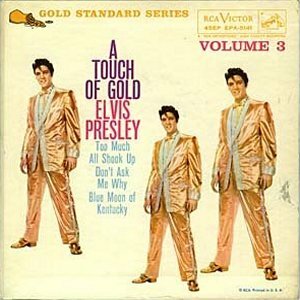 RCA Victor released four albums compiling old material during this period, most successfully Elvis' Golden Records (1958) (which rose to third position on the LP chart) and 50,000,000 Elvis Fans Can't Be Wrong. During his final months in the Army, Presley started to experiment with new material and thinking ahead to his anticipated return to recording. For his first scheduled recording session, Presley considered The Four Fellow's "Soldier Boy", the Golden Gate Quartet's "I Will Be Home Again", The Drifters' "Such a Night" and Jesse Stone's "Like a Baby". His friend Charlie Hodge taught Presley techniques to improve his breathing and expand his range. For inspiration, Presley used Roy Hamilton's "I Believe" and his version of "Unchained Melody", the traditional Irish song "Danny Boy", and Tony Martin's "There's No Tomorrow" (an English adaptation of "'O sole mio"). Presley also studied the phrasing and notes of records by The Inkspots and the Mills Brothers. By the end of his time in Germany, Presley had added a full octave to his vocal range. Presley returned to the United States on March 2, 1960, and was honorably discharged with the rank of sergeant on March 5. While Presley was in Germany, manager Colonel Tom Parker negotiated new terms with RCA Victor for Presley to fulfill his contractual obligations with film soundtracks. Parker also obtained an increase in Presley's salary and a profit share from producer Wallis, and negotiated an appearance on The Frank Sinatra Show. Meanwhile, to assure publishing royalties, Bienstock commissioned new lyrics for "O Sole Mio" since the tune was already in the public domain. On March 20, Parker sent a chartered Greyhound bus to transport Presley and his entourage from Memphis, Tennessee to Nashville. The session personnel consisted of guitarist Scotty Moore, drummer D.J. Fontana, pianist Floyd Cramer, guitarist Hank Garland, bassist Bobby Moore, percussionist Buddy Harman and the backing group The Jordanaires. Presley's original bassist Bill Black declined to join the sessions as he was enjoying success with the Bill Black Combo. To prevent possible disruption by fans, the musicians were initially told they were going to play on a Jim Reeves session. RCA executives Sholes and Bill Bullock were joined in the control booth by Parker, his assistant Tom Diskin, A&R head Chet Atkins, engineer Bill Porter and Hill and Range's Bienstock. RCA Victor's Studio B had recently been equipped with a new three-track recorder. To further improve the recording of Presley's voice, Porter had Telefunken U-47 microphones placed in the studio. The U-47 was the first condenser microphone that could switch between omnidirectional and cardioid patterns. The microphone could be used for vocals, instruments and full area coverage. The first song recorded was Otis Blackwell's "Make Me Know It", which was mastered in nineteen takes. "Soldier Boy" was later recorded in fifteen takes, followed by the non-album cuts "Stuck on You" and "Fame and Fortune". The last song recorded during the March session was a non-album cut, "A Mess of Blues". A new session was arranged for April. Presley then left for Miami, Florida, where he taped The Frank Sinatra Timex Show: Welcome Home Elvis. Elvis Is Back! represented a new sound for Presley; it moved him further toward pop music, a direction he continued to take over much of the decade. The album features a mixture of genres, including rock, rhythm and blues and pop ballads. Critics generally agreed that Presley had acquired a "deeper, harder voice quality",and said his interpretations were "increasingly sophisticated". The album includes a variety of material; Presley and the session musicians, known as "The Nashville A-Team", had the benefit of recording equipment that was state-of-the-art for its time. [a] Elvis Is Back! was the first Presley album to be released in stereo. The album's front cover shows Presley standing in front of a blue stage curtain, dressed in an Army trench coat and smiling as he glances to his left. 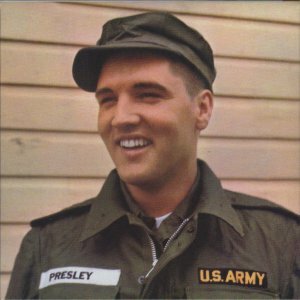 The back cover features an image of Presley grinning; he is dressed in an Army regulation fatigue jacket and cap. The inside of the gatefold cover features fifteen photographs of Presley taken at various times during his Army service. The album contains twelve tracks; it opens with "Make Me Know It". The second track is a cover of "Fever", which Presley based on Peggy Lee's version, although his recording incorporates finger-snapping and the sounds of the two percussionists are divided between the two channels of the stereo mix. On "The Girl of My Best Friend", Presley is supported with doo-wop backing vocals by The Jordanaires. The fourth track is "I Will Be Home Again", a slow ballad performed as a duet with Charlie Hodge. The fifth track is "Dirty, Dirty Feeling", a song characterized by its "raunchy rock sound" and satirical humor; it was written by Leiber and Stoller, and had been previously discarded from the soundtrack of King Creole. The final track on side one is "Thrill of Your Love", on which Presley is accompanied by Cramer on the piano. The second side opens with "Soldier Boy", which features a change of key in the chorus. This is followed by "Such a Night", which has saxophone accompaniment by Randolph. The next track is the blues number "It Feels So Right", which features lead guitar and heavy use of percussion. The following track is "Girl Next Door Went A-Walking", which was brought in by Moore.The album closes with the rhythm and blues songs "Like a Baby" and "Reconsider Baby". Presley played the lead guitar on both tracks, the latter of which features long saxophone and piano solos. The first single from Elvis Is Back!, "Stuck on You", was released two days after its recording with "Fame and Fortune" on the B-side, attracting 1.4 million advanced orders. 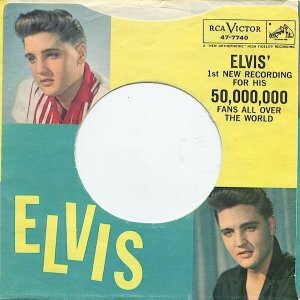 The pre-printed single sleeve said, "Elvis' 1st New Recording For His 50,000,000 Fans All Over The World". It was the first Presley single to be released in stereo. Elvis Is Back! was released on April 8, 1960, in stereo and monaural versions. The album reached number two on Billboard's Top LP's and topped the UK Albums Chart. Despite this, its commercial performance was a disappointment, with fewer than 300,000 copies sold in the United States. Billboard magazine said, "Elvis is back and singing better than ever in the rock and roll style he made famous". The New York Times called the record "drab and lackluster". Referencing Presley's change of style, High Fidelity magazine said: "Presley obviously finds it hard to record his old gusto ... Perhaps [the recordings] are the first attempts to master new styles". Hi-Fi Stereo Review magazine also remarked on the change in Presley's style, calling the album "musically schizoid" despite deeming the overall recording "good". The review said Presley's ballads were "the worst he's ever made" but lauded "his former vitality" in the "commercial rockabilly romps". In his review for AllMusic, Bruce Eder wrote that the album "shows a mature Elvis Presley [who] displayed the rich, deep vocalizing that would challenge critics' expectations of Elvis Presley playing rhythm guitar throughout". Eder concluded that on Elvis Is Back!, Presley "comes off better than on any of his other albums since arriving at RCA". Will Hermes of Rolling Stone praised its "wildly varied material, revelatory singing, impeccable stereo sound". Writing for Rough Guides in 2004, Paul Simpson commented: "Among the 1800 or so records in Elvis's collection at Graceland is a copy of Elvis Is Back!, almost white from the number of times it was played. You can understand why this would be his favourite album." Simpson admired Presley's blues singing on "Like a Baby" and "Reconsider Baby", and added, "it's hard to believe that this commitment and exhilaration was to be heard only fitfully for most of the 1960s, often on songs buried on B-sides or as bonuses on dodgy soundtrack albums." PopMatters's Steve Horowitz said the album helped Presley grow from "teen idol" to "adult entertainer". Horowitz continued: "Presley's voice was still strong and clear. He could belt out the blues one minute ... and then sound sophisticated the next ... without changing character." The Seattle Post-Intelligencer also gave a favorable review, saying, "Elvis Is Back! finds [Presley] demonstrating both versatility and an affinity for handling a range of song styles". Writing in The Daily Telegraph in January 2015, Neil McCormick included Elvis Is Back! among the artist's essential works. McCormick wrote: "It is almost universally accepted that Elvis, who never saw active service, 'died' in the army. Yet Elvis Is Back ... is arguably Presley's masterpiece, in which he tackles ballads, blues, rock, pop and gospel with a quality of control that somehow makes his innate sensuality even more potent." Simon Gage of Britain's Daily Express described the album as "[Presley's] finest". Critic Robert Dimery included the album in his book 1001 Albums You Must Hear Before You Die. RCA reissued the original 12 track album on Compact Disc in 1990, and again in 1999 with bonus tracks. In 2005 Elvis is Back! was reissued on the Follow That Dream label in a 2-disc CD collection. This edition contains previously unreleased outtakes of the studio album and combines all previously released versions of the masters and outtakes. Legacy Recordings released a remastered version of the album together with Something for Everybody in 2011. 1. "Make Me Know It"
3. "The Girl Of My Best Friend"
4. "I Will Be Home Again"
6. "The Thrill Of You Love"
9. "It Feels So Right"
10. "Girl Next Door Went A'Walking"
15. "It's Now Or Never"
16. "A Mess Of Blues"
17. "Are You Lonesome Tonight?" Disc one - Elvis is Back! Up until recently I had never listened to this as an album. I knew the songs from the sixties box, and although I often listened to them via the sixties box, I am an album guy. I like to sit and listen to an album, as intended by the artist. Up until this point (and the albums prior are good, don't get me wrong) I am not sure that Elvis had conceived an album in a post '65 mindset. Listening to these tracks as laid out on this album, it feels like an album, there is a cohesion that a good album has and it is here. So perhaps in some regards the album mindset came into effect in 1960 for the rock world ... perhaps, I don't pretend to be fully fluent in this particular era, and it is eight years before I was born. The other thing that stands out is how good Elvis' voice sounds. It's like while he was in the army he took lessons, or did exercises to strengthen and extend his voice. Obviously I have no idea if this is true, but that is just an observation of what sits before me here. I was surprised to read in the copied info up there that Elvis had played some lead guitar on this album, I was never aware that he ever had. Thius thread has been very revealing to me in terms of Elvis, the musician. I know it's ignorant but I had never really considered Elvis a musician, and I know that's ignorant, but by the time I was listening to and enjoying Elvis it seems most people seemed to purely refer to the guy as a bit of a joke that used to be big in the early days of rock. As I have listened to the albums and studied the info on him, nothing could be further from the truth. This guy was the real deal and if not for his insecurities and (later day) terrible management, it is scary to think how much bigger he could have been. The songs on here are great, I mean really great, I do understand some folks including my dad, have a tendency to say "well in the fifties .... but after that no" that seems so ignorant to me. This album, although not as raw as his fifties recordings is so much better in so many ways, that the whole "fifties Elvis" mindset seems rather empty. There sre a vast variety of songs on here and yes they are still in a fifties styling I guess, with the backing vocals etc, but they are varied and excellent. And as I said earlier the vocals are quite astonishing. What do you think of this album? these songs? the vocals? Elvis on lead guitar? Let us know what you think and tomorrow we'll move into the first song. Dave Hoos, GimmieSomeTruth, D.B. and 6 others like this. Rickchick, GimmieSomeTruth, Timmy84 and 4 others like this. You bring up some great points. I'm with you in that I find people who dismiss Elvis post-army are really missing something, particularly with the 1960-1962 non-soundtrack material. Elvis Is Back! is the best of them. I imagine its reception to the great masses would have been stronger had the key singles been included / replaced some of the 'lesser' tracks, but I'm glad they did it in the way they did it. Wonderful album all around. While they're very tough to find in nice shape, early stereo LPs of this title sound magnificent. My copy is one of my favorite albums to play. Rickchick, McLover, Timmy84 and 10 others like this. You say it all so well here, Mark, Elvis's voice, production, and versatility really excelled in the late 1950's into the early 1960's. This album is arguably his greatest one ever, along with From Elvis In Memphis, in my humble opinion. Yes indeed, Elvis was a pretty decent guitar player as Johnny Cash himself one noted and he actually could play the piano by ear. I love the range and diversity of this album. He should have tried to make at least two more albums like it before Elvis left us. The music world is a far richer place with this iconic album in it. Rickchick, GimmieSomeTruth, palisantrancho and 5 others like this. This single introduced a refined sound from Elvis and showcased his evolution from the 1950's era period. And while Elvis never received a formal production credit, he very much was involved with the new direction of this music. Anyone familiar with his musical output from Germany knows how he began to develop a new direction and infuse new influences into his musical vision. This was single was a significant artistic statement and one that was reinforced with the stellar "Elvis Is Back!" LP release. artfromtex, RSteven, JimmyCool and 1 other person like this. I do think Elvis intended to continue with the direction of "Elvis Is Back!," but the strength of song submissions started to decline, which become evident on "Something For Everybody." S. P. Honeybunch, RSteven, JimmyCool and 1 other person like this. Well, I do agree with you that Something For Everybody is no match for the diversity and brilliance of Elvis Is Back, but I do think it is one of Elvis's better studio albums of the 1960's. I love Elvis's mellifluous voice and his vocal on There's Always Me is truly fantastic. I Want You With Me and Give Me The Right give the album some grit as well, but as much as I do love this album, it still cannot stand up to the true greatness of its predecessor. Mr. H, mark winstanley and PacificOceanBlue like this. D-rock, Timmy84 and Dave112 like this. Dave Hoos, Dave112 and mark winstanley like this. Stuck On You is pretty fluffy, but I enjoy it anyway. The live version on the Sinatra show has the edge over the studio version for me. Definitely--and Elvis's stage moves are ineffably cool. He knows the exact amount of restraint to use in wrapping the audience around his finger. The live version of "Fame and Fortune" is also superior to the recorded one. It's a downright mesmerizing performance. I never thought much of the song until I saw it live. What a pity there isn't more footage from this period! Shawn, mark winstanley and PacificOceanBlue like this. I'm of two minds regarding Elvis Is Back! On one hand, I think it would have sold better at the time and be better known today had it included the three huge hit singles. It could have been a truly iconic album for Elvis (as in, one that everyone has heard of). On the other hand, the album as released flows almost perfectly (I really can't stand I Will Be Home Again and always skip it), and in some ways, including the singles would have distracted from the rest of the material. Either way, it's a fantastic album, and puts the lie to the idea that Elvis was somehow lessened when he came out of the Army. His talents hadn't disappeared; he just expressed them in a different way. Dave Hoos, D.B., Dave112 and 3 others like this. I dont disagree, but i don't skip any songs ... it is actually one of the reasons i think of it as a real album, not just a compilation of songs. Dave Hoos, artfromtex and Dave112 like this. This is a pretty short song, coming in at just under two minutes, but it doesn't leave you feeling like you missed anything. There isn't a groan of "oh, is that it" at the end. The song bounces along nicely and the instrumentation is perfect in context of the song. There is a nice backing vocal arrangement that doesn't over power the song, it sits at a nice level and fills the spaces nicely and under the main vocal. I get the feeling the band had a blast laying this one down. It works very nicely as an opener. Dave Hoos, Shawn and Dave112 like this.